It was a busy end of summer fall! Client projects, websites in development, working on creating courses, starting some marketing coaching, and doing my bit to prepare for the exciting Library Marketing and Communications Conference, in the Dallas suburb of Addison, TX Nov 3-4. I was part of a team of library professionals who volunteered their time, blood, sweat and tears from across North America to bring together a ‘new’ conference, in a record amount of time. 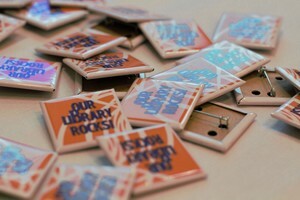 We saw a niche (marketing in/for libraries) and we worked to fill it – with amazing success. When I first wrote the draft of this post before the conference I was hoping for success … and the actual event fulfilled it and more. We had 28 sessions in 4 tracks across 2 days, 2 keynotes, a ‘birds of a feather’ networking lunch, dine-arounds, 250+ attendees, rooms buzzing and a wait list of library folks who wanted to come and couldn’t get in. I’d say that’s a success! This is a longer than normal post because I’m still just so darned excited and happy with how this event turned out, the great people I worked with and the enthusiastic support from all the attendees and those wanting to attend. We’re already in planning mode for 2016! 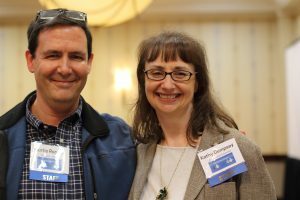 There had been iterations of a small, specialized conference for library communications put on in the Philadelphia area (my backyard) by Bob Kieserman, of Kieserman Media. He did conferences for Library Managers, Library HR/Staffing, Library Communications and others. Niches and topics that weren’t being fully served by divisions, roundtables or sections of the large library associations or even state associations. Those larger conferences might have a session or two on design or outreach, doing PR, or experiences with social media – but not a full day or more dedicated to the topic. Even the great conferences from InfoToday didn’t address marketing and communications at the level that these small gatherings did. 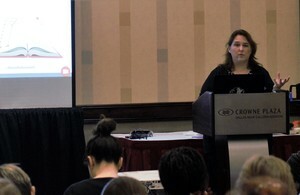 I presented three times for conferences led or started by Kieserman, two dedicated to library communications. It was a wonderful opportunity given this is MY niche and my wheelhouse – a chance to talk to my libraryland peeps, here stories and real challenges, network and also look for consulting or training opportunities. But Bob retired from the conference game at the end of 2014 and there wasn’t going to be a library communications themed conference in 2015. Unless some other entity stepped up and led the way. 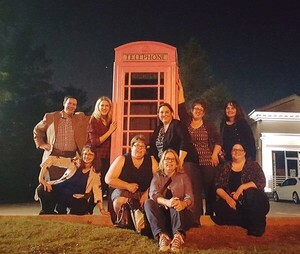 The original LMC Conference Planning Group – night on the town! Yes, the phone booth is pink!! A group of enthusiastic library marketers, former speakers and presenters at these Kieserman library conferences, attendees and just really dedicated library communicators got together via an email thread to see if we had the skills, resources and interest to put on a library marketing themed conference without a formal group, association or organizational backing. Did we have enough time? Could we do an event in 2015 and not lose out on any interest still circulating from the Kieserman events? Was there still enough interest nationwide in a conference dedicated solely to marketing and communications by various libraries? The answer has been a resounding YES!! 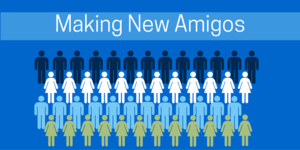 In the short time from our exploratory group emails in winter 2015, to finding Amigos Library Services as a partner to handle conference logistics, to crossing our fingers in sending out a call for proposals in July with a 2 week response deadline, we all ran fast and hard, managing to clear hurdles with what hindsight says is relative ease! We hoped to have just enough proposals to fill our dream schedule of 21 sessions (3 tracks over 2 days) – and we counted on a number of us on the planning committee submitting ideas. We hoped we’d get enough interest and commitment to hotel rooms to fulfill our part of the bargain with Amigos and ensure we’d have any kind of conference at all. We hoped we were all as good at marketing a new conference as we were at promoting our libraries and library consulting businesses – we better practice what we preach in getting the word out! I guess we really do know what we’re talking about in marketing for libraries! Because we didn’t get enough proposals to fill 21 slots. No, we had enough to fill 5x that many! We had so many we begged the hotel for another room, another track and got to 28 sessions. That’s right, we received over 100 submissions, all with a 2 week proposal window. Wow. We started filling up hotel rooms before we had all the submissions in. Before we knew who would be speaking, before a final program! (heck, before a preliminary program or notifying all the accepted speakers). People were willing to come and be part of this conference knowing only that it would be 2 days dedicated to topics, training and case studies in marketing for libraries. For public libraries, academic libraries, all libraries big and small. Design for non-designers, social media for libraries,social media ads, talking to politicians about the case for local libraries, promoting your programming, what tools are you using in your library and many more topics were included in the call and library land answered. So many incredible session ideas, success stories to share, best practices and new training. It was very hard for the programming subteam of the planning committee to make tough decisions on who was in or out. We were so successful we cut back on marketing. Yeah. They say you should never cut back on marketing, not even in the boom times. But we did stop our full-press promotion because we sold out the conference with 2 months to go. We literally had no more room in the inn. The hotel had reconfigured our rooms more than once and we ditched the round tables for just rows of chairs to pack in as many as we could. 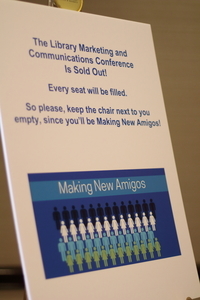 We all were ‘Making New Amigos’ (our conference ‘theme) as we sat close, networked everywhere, and spilled out of the rooms. How lucky and fortunate is that?! The more conference calls I was on, the more emails, the designing of graphics, doing social media and hearing the excitement of my colleagues – the more proud I was to be part of this team and this conference endeavor. 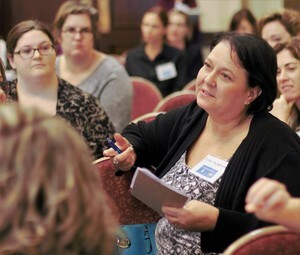 We knew in our guts there was a strong need for professional development, networking and sharing of successes on the topic of marketing and communications for libraries. 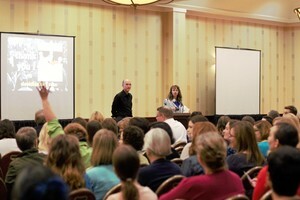 You in library land who heard our call, who booked all our rooms and went to TX in early November, you proved us right. Abby Annala of Loyola University Chicago; Joan Barnes of University of Nebraska; Jodie Borgerding of Webster University,MO; Becky Jones of University of Wisconsin-Whitewater; Robin Klaene of Kenton County Public Library, KY; Heidi Nagel of Kent District Library, MI; Mark Aaron Polger of CUNY Staten Island; Michelle Rempel of Grand Prairie Public Library of Alberta, Canada; Curtis Rogers of the South Carolina State Library; Rita Spisak of Kennesaw State University, GA; and Laura Tomcik of Wheaton College, IL. You’ve also proved my own business model of teaching, training, speaking and consulting on marketing and communications for libraries is right. So thank you. Thank you and it was so wonderful to see you in Texas! Now it’s on to planning for 2016 – because that’s what you’ve asked for from the practically the moment you all showed up in TX.